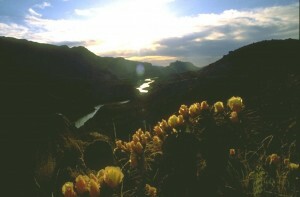 Big Bend West features River Road and Big Bend Ranch State Park. El Camino del Rio between Presidio and Lajitas, was described by National Geographic magazine as one of the 5 most beautiful drives in the US. Stop for breath taking panoramas, and hike up a slot canyon before driving to Santa Elena Canyon. Meet lobby of Holland Hotel. Drive by Cibolo Creek Ranch that stocks exotic animals from buffalo to elk to antelope. Shafter is a silver mining town in a beautiful location. After a convenience stop in Presidio, we head east towards Lajitas on TX 170, The River Road. In 1967, National Geographic called it "one of the top 5 scenic drives in North America". It has not changed since then. We stop along the way for short walks, photo opportunities and a picnic lunch in Big Bend Ranch State Park. This is one of the most scenic roadside stops in the state enjoys an unbroken view of the Rio Grande in both directions, and a place to gaze straight down about 800 feet to the river below. After a picnic lunch, hike into a shady, vertical walled, water carved slot canyon, sculpted into hard igneous rock. Enjoy the natural reverberation from the song of the Canyon Wren. 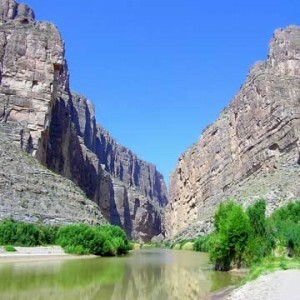 We enter Big Bend National Park, fee included with trips cost. This amazing highway traverses the western foothills of the Chisos Mountains, and past a variety of geological oddities and beautiful points of interest. Short hike at Burro Mesa Pour-Off. Noted author Edward Abbey wrote that "if light were sound, Santa Elena would be a symphony. 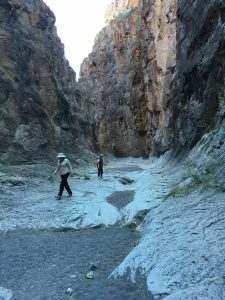 We will hike the 1.5 miles round trip into the canyon and in Go Big Bend's opinion, one of the most remarkable scenic locations in Big Bend and perhaps in the entire state of Texas. Return to Alpine via Maverick Road (unpaved), then north on TX 118. Drop guests at Holland Hotel approximately 7:15 pm.